Dr. Syntax: Which Section of the New York Times D'You Read? Which Section of the New York Times D'You Read? I haven't seen one recently, but the New Yorker often used to run newsbreaks under the heading "Which Paper Do You Read?" where two newspapers had laughably contrasting accounts of the same event. I thought of this yesterday when the New York Times reviewed a new Bloomsbury Press book: Peter Clarke's short, crisp biography of the brilliant economist John Maynard Keynes. It's subtitled The Rise, Fall and Return of the 20th Century's Most Influential Economist. The Times reviewed Keynes twice in the same issue--once in the Book Review, once in the Business section. For a publisher, this is like getting the Daily Double on Jeopardy--at least when they're two good reviews. These were very favorable, but as sometimes happens the two reviewers seem to have read two different books. Devin Leonard calls Clarke's "the liveliest" of three new works on Keynes, and says his prose "sparkles." 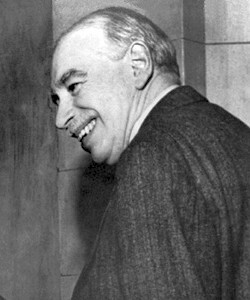 But Leonard thinks Clarke's "gossipy" account of Keynes's life is "the place to begin if you want to understand the economist’s personality and charisma." He thinks other authors are stronger at explaining the economic ideas that helped pull Britain and (even more so) America out of the Great Depression. Over in the Book Review, Justin Fox thinks Keynes's life is too interesting for Clarke to do it justice! He says, by contrast, Keynes "takes off" only when it gets to the economist's work. "Clarke lays out the development of Keynes’s economics from the mid-1920s to his General Theory, and it’s a gripping journey," says Fox. I'd have been happy with either one of these reviews. Together they go to show once again that much of any book review is in the eye of the beholder. And I hope they suggest that whether you're interested in Keynes's life or his ideas, Keynes is a little book with a lot to offer.